Well, okay, I am a few days early, but I don’t want to miss this occasion. On 13th October 2010, my great, great, great grandfather, Johann Gottfried Schütz, turns 200. With a bit of luck, we hope to make a pilgrimage to his grave in the next week or so. You come from good stock, David. These old Lutheran German folk were ‘salt of the earth’ people. Australia’s debt to these folk is yet to be calculated. What a beautiful glimpse into your family history, David, thanks for sharing. Does that mean you’ll have a good ol’ fashioned ‘Schütz-en-fest’ on the 13th, David? It’s an interesting area, with an interesting history. We have close friends who live near by (in the old Herbig — of tree fame — dairy farm) and we visit often and explore. PS: I assume you photo-shopped out the pipe that was in Johann’s mouth? The “Schützenfest”, as you know, Tony, takes place in October each year in Hahndorf. 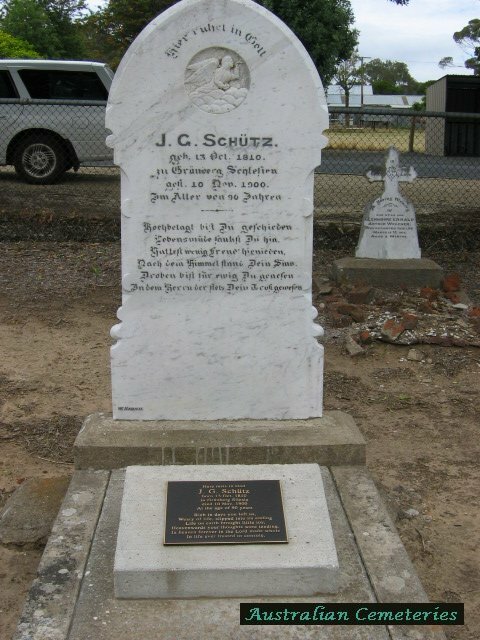 Great, Great, Great Grandpappy Schütz is buried in Eden Valley (home of the dilectibable Rieslings! ), but Hahndorf was the first place that any of my ancestors lived in Australia. Great, Great, Great, Great Grandpa and Grandma Pfeiffer and died there in the winter of 1839. Unfortunately the location of their graves was never marked. Is this where the Schutz good looks comes from?